The USS San Diego will head to sea this week to practice recovering NASA’s Orion spacecraft in preparation for the first test flight later this year. The Orion is designed to carry four astronauts into space on long-duration missions to the moon, near-earth asteroids and potentially Mars. 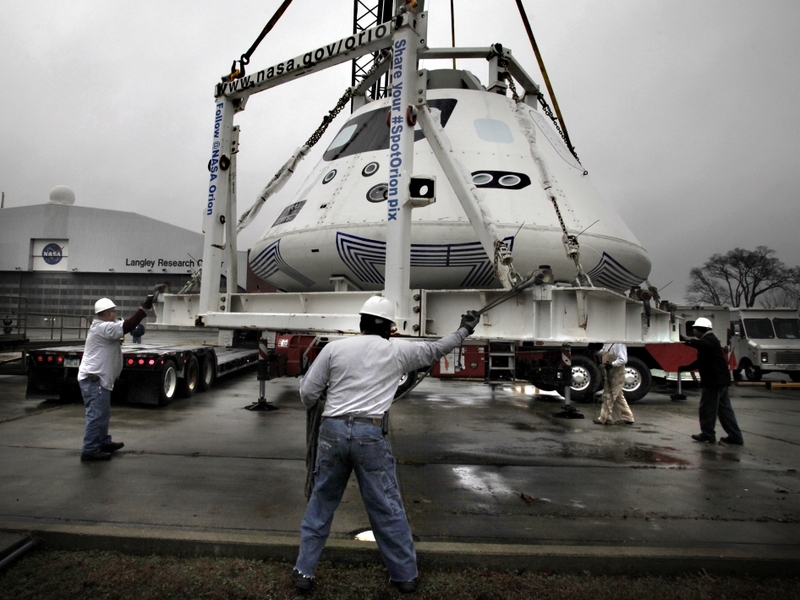 An Orion capsule is readied for shipment to San Diego for recovery testing. NASA photo. During the recovery test, the spacecraft will be set adrift in open and unstable waters, providing NASA and the Navy the opportunity to recover the capsule into the well deck of the USS San Diego. The first test flight, scheduled for September, will use a Delta IV Heavy rocket to send an unmanned Orion to an altitude of 3,600 miles, then back into the atmosphere at a speed of more than 20,000 miles per hour, simulating re-entry from a trip to the moon or beyond. The USS San Diego is an amphibious transport dock designed to carry a fully-equipped Marine battalion.